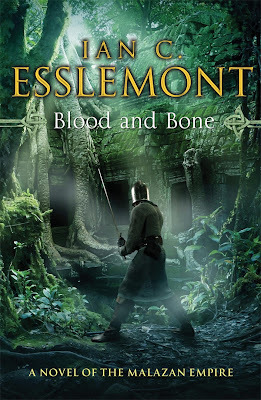 Here's the UK cover art for Ian Cameron Esslemont's Blood and Bone, his forthcoming fifth Malazan novel. The novel is due for release in November this year. Barring last minute delays, that will make for three Malazan novels in one year (following Esslemont's Orb, Sceptre, Throne in January and Erikson's Forge of Darkness this month). No ships, how shocking. I think this book will be great, nice to have the "Crimson Guard" back. Huh, who knew that Angkor Wat was on Wu? The semi-realistic art style is so awkward, especially with the armored figure. It reminds me of a 90s CRPG cutscene. Yeah, I wondered about that and then looked it up as well and, indeed, it is just a photoshopped image of Angkor Wat indeed! If you look close you can just see a boedhha statue peek out from behind the warrior. Awful cover. That would only have literally taken just a few minutes in Photoshop to do. Not a professional cover at all, just stock images put together by a machine.